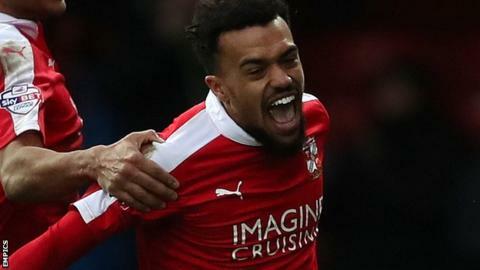 Nicky Ajose scored a hat-trick as Swindon beat Blackpool in a game of five goals at the County Ground. The former Manchester United trainee netted the winner two minutes from time after earlier strikes in either half. Tom Aldred had headed Blackpool into an early lead before Ajose levelled for the hosts 15 minutes later. Ajose's close-range second gave them the lead on the hour, but Danny Philliskirk levelled from the spot after Clark Robertson was fouled. Match ends, Swindon Town 3, Blackpool 2. Second Half ends, Swindon Town 3, Blackpool 2. Attempt blocked. Brad Potts (Blackpool) right footed shot from outside the box is blocked. Goal! Swindon Town 3, Blackpool 2. Nicky Ajose (Swindon Town) right footed shot from the centre of the box to the bottom right corner. Attempt saved. Jonathan Obika (Swindon Town) left footed shot from the right side of the box is saved in the centre of the goal. Corner, Swindon Town. Conceded by Will Aimson. Attempt blocked. Brandon Ormonde-Ottewill (Swindon Town) right footed shot from the centre of the box is blocked. Attempt saved. Nicky Ajose (Swindon Town) left footed shot from outside the box is saved in the centre of the goal. Corner, Swindon Town. Conceded by Clark Robertson. Attempt blocked. Nicky Ajose (Swindon Town) right footed shot from the centre of the box is blocked. Substitution, Swindon Town. Ellis Iandolo replaces Fabien Robert. Brad Potts (Blackpool) wins a free kick in the attacking half. Corner, Blackpool. Conceded by Nicky Ajose. Louis Thompson (Swindon Town) wins a free kick in the attacking half. Substitution, Swindon Town. Louis Thompson replaces Drissa Traoré. Goal! Swindon Town 2, Blackpool 2. Danny Philliskirk (Blackpool) converts the penalty with a right footed shot to the high centre of the goal. Penalty conceded by Bradley Barry (Swindon Town) after a foul in the penalty area. Penalty Blackpool. Clark Robertson draws a foul in the penalty area. Corner, Blackpool. Conceded by Jamie Sendles-White. Attempt blocked. Nicky Ajose (Swindon Town) right footed shot from outside the box is blocked. Goal! Swindon Town 2, Blackpool 1. Nicky Ajose (Swindon Town) header from very close range to the centre of the goal. Assisted by Bradley Barry with a cross.